Mind you though, Xerxes can be a bit too sniffy sometimes...you do wonder what they're looking for. Cassie can spend the day running around the yard "hunting" for those lizards. I hate those things..they lay eggs during the winter and they've been hatching. Now there's plenty for cassie to watch and go after. Yech...a yard full of lizards. I can just imagine them darting all over the place! 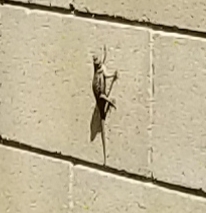 Here's a picture of one of the lizards on the wall. Quite big! Good snack right Cassie? She's on the hunt right now. Cassie seems to have located one and is waiting for it to move...i dont see it. They're about 6 or 7 inches and very fast. Visited my friend in AZ. We would be sitting outside, and even watching tv outside. That was weird in itself and we would see those little lizzards crawling up her patio wall. Yikers! Cassie here.. Im in lizard heaven. It's very warm today and those suckers are everywhere. I'm watch'n and wait'n for one to cross my path. Im on it...crazy thing, they seem to know to stay away from my area but I can see 'um. You've got this Cassie! Go hunt!